West Virginia CTE students have unique post-secondary opportunities to showcase their high-quality technical skills and academic achievements through the Governor’s Workforce Credential, National Technical Honors Society, and scholarships. The Governor’s Workforce Credential signifies a student’s knowledge of business processes within a Simulated Workplace environment. The West Virginia Governor endorses only the top CTE completers in the state for their achievements in academics, technical training and work readiness. 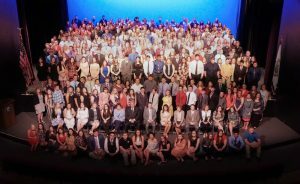 The National Technical Honor Society currently serves approximately 100,000 active members and nearly a million members since its inception in 1984. Awarding over $1.7 million in scholarships to date, NTHS honors the achievements of top CTE students, provides scholarships to encourage the pursuit of higher education, and cultivates excellence in today’s highly competitive, skilled workforce. The Albert Yanni Scholarship provides high quality career technical education (CTE) students an opportunity to pursue advanced education and/or training related to their career aspirations. The U.S. Presidential Scholars Program was established in 1964, by executive order of the President, to recognize and honor some of our nation’s most distinguished graduating high school seniors. The EdVenture Group out of Morgantown maintains the WVSimulatedWorkplace.com website, which has been created for West Virginia career technical education (CTE) students. Within this site, CTE students can locate scholarships, internships and competitions. West Virginia EDGE initiative provides a forum for the secondary and postsecondary levels to re-define, align, and strengthen program offerings through seamless curricula. The West Virginia definition of a seamless curriculum is a continuum of competencies which provides the transition from one education level to another without unnecessary duplication. Student progression is based on the mastery of competencies to established standards. The WV High School Business Plan Competition’s goal is to work collaboratively to help move the state forward by engaging young minds to solve West Virginia’s greatest issues. The future of our state is at hand, and we are working to involve young talent from across the state to share their ideas. The competition is open to all juniors and seniors in high schools and career technical education centers in West Virginia. For rules, important dates and additional information visit the website.